February 6, 2018, was a historic milestone for the adoption agency A Child’s Hope. We placed twins, which were the 349th and 350th children adopted through the agency. It was hard not to get a bit teary when I held them in my arms. 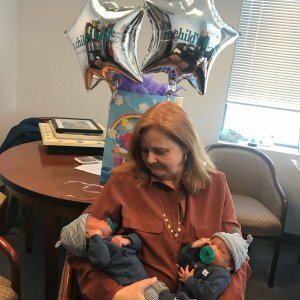 In our first year, 2000, we placed six newborns in North Carolina from a small office in one corner of my law practice, Parker Herring Law Group, LLC. We had one part-time assistant and one part-time social worker. In 2017, A Child’s Hope placed 18 newborns and we have a full-time staff person, a part-time assistant and eight adoption counselors spread throughout the state. A first in North Carolina, A Child’s Hope adoption agency was started by two attorneys and is still directed by an attorney today. Unlike other adoption agencies, we are not directly affiliated or tied to any faith-based organization. This means the decision of who we serve is not predicated on the mission of any specific religion. For A Child’s Hope, our “mission” was and still is, to reduce the time and cost of adoption. After adopting my oldest son from New Mexico in 1998, his dad and I were stressed to the max emotionally and financially. His adoption cost us nearly $55,000 in 2018 money ($36,000 in 1998). When we started the adoption agency, I would answer the birthmother hotline and be ready to drive across the state at a moment’s notice. I remember driving to one address where the young woman had her baby at home because she did not want to tell her mother she was pregnant. On the way to her apartment, I walked her through tying off his cord with a piece of string and swaddling him until I could get there. It was also a time when I was not able to find homes in North Carolina for the African-American children, like the twins, that needed adoption. I would literally spend days calling all around the United States trying to find families for these babies. Today, it is a different story. Adoptive parents in North Carolina only see a child to call their own, not the racial or ethnic heritage of the birth parents. It is the same for birth mothers. In 2000, placing a child with a well-qualified single parent or same-gender couple was nearly impossible. Today, birth mothers are much more open to selecting non-traditional families. So today 350th placement. Hopefully, there will be another 100 or so before I retire. If you are a birth mother, click here to discover more about placing your child for adoption. If you are interested in becoming adoptive parents email us at ACH@AChildsHope.com or call 919-839-8800. A mother of three children, E. Parker Herring has a deep respect and understanding of family law and the adoption process (for which she’s adopted two children of her own). She is the founder and director of A Child’s Hope, a North Carolina licensed adoption agency, located in Raleigh that focuses on helping birthmothers and families looking to adopt within the state. A Child’s Hope has placed 350 children since 2000, and is the only North Carolina domestic adoption agency directed by an attorney. Herring is a Board-Certified Family Law Specialist who has practiced family law for nearly 30 years in the Raleigh area. She is a member of the NC Bar Association, the Wake County Bar Association, and the NC Collaborative Lawyers.